Luxottica, leader in the eyewear sector, offers to all designers the chance to design a metal eyewear line, both sun and prescription eyewear, that may recall an essential style and highlight the innovative patented closing system. Luxottica is leader in the design, production, distribution and sell of high-end, luxury and sport eyewear. Every collection, every pair of eyeglasses is the result of an ongoing process of research and development, whose aim is to anticipate and interpret the needs, desires and aspirations of consumers all over the world. For this reason, the Luxottica products are worldwide well acknowledged and stand out for their excellent design and high quality. 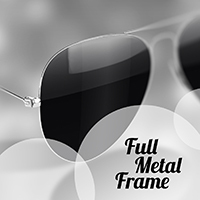 The will to experiment new design solutions has led Luxottica to sponsor the Full Metal Frame contest. All participants are invited to take up an important challenge aimed at finding the design for an upcoming eyewear line, that is identified by its innovative hinge-temple joint patented by Luxottica. The participants will have to design and develop a line of sun and prescription metal eyewear, identified by the same style. The full frame (full-rim) and the temples of the glasses will be made out of 0,5 mm metal sheets. Special attention is required for the employment and understanding of the patented joint, that allows to connect the hinge and the temple without the use of screws (see Material file). Style: explore stylistic solutions for sun glasses and prescription glasses that together will form a product line characterized by the attention to detail and able to covey the value of essentiality. The new eyeglasses will be presented to a well-informed Client that is looking for highly technical and technologically driven products. Shape: find clean lines able to identify both eyeglasses, respectively sun and prescription eyeglasses, that share the same style. The shape must give maximum value to the functional patented joint (see the attached Material file for size and functioning). Materials: employ metallic materials for the full-rim and the temples, while choosing the material you think most appropriate for all the other elements. Avoid the employment of precious materials (gold, silver, platinum, etc.) or jewels. Technologies: there are no specific constraints in the employment of particular production technologies. Size: for the correct realization of the eyewear pay attention to the size reported below, that specify respectively the distance between one temple and the other and the overall length of the temple. - Head space or width (distance between the temples): 128-138 mm (men), 125-135 (women). - Temples length: 145mm or 140mm or 135mm or 130mm. The length may vary according to the design and is measured from the hinge-axis to the temple tip. Furthermore, in the Material file you will find all specifications about the minimum measurements of the hinge, below which there is no feasibility. Logo: the Luxottica logo or other logos related to Luxottica must NOT be employed, neither on the glasses nor on any image used for presentation purposes. Upload information: in case you want to submit both eyewear designs, for sun and prescription glasses, you are invited to make a single upload containing both models. For the duration of the pre-emption right, the Client offers an extra chance to all participants setting a price of Euro 1,500 (one-thousand-five-hundred) for the purchase of the license fee for the economical exploitation of the projects not-acknowledged as the winning proposals (For more info read the Contest Agreement from the upload page). Deadline extension: Upon great request of the public, we are glad to inform you that Luxottica has decided to extend the deadline for submissions till 17th July 2014 giving you more time to develop your projects. We remind you that you are all invited to design the new line of eyeglasses employing and reinterpreting the hinge described in the Material files. Do you want to stay updated about "Full Metal Frame"?